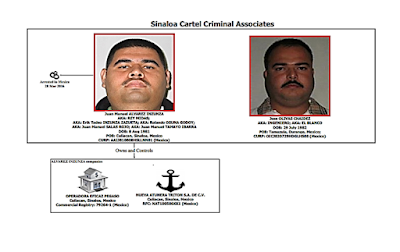 “A strategic blow to the Sinaloa Cartel”, is how the U.S. Treasury Department describes actions against two key Sinaloa Cartel operatives, by adding them to the Kingpin List. On Tuesday, the Treasury Department imposed Kingpin Act sanctions on two men with alleged ties to the Sinaloa Cartel, including one of its key money launderers. As a result any and all U.S. assets are now frozen, and they are barred from doing business in the U.S. The Treasury office says that the move will greatly compromise the cartel’s ability to move drugs and launder drug money from the U.S. to Mexico, South America, and Central America. WASHINGTON – Today, the U.S. Department of the Treasury’s Office of Foreign Assets Control (OFAC) designated two Mexican nationals and two Mexican companies pursuant to the Foreign Narcotics Kingpin Designation Act (Kingpin Act). Juan Manuel Alvarez Inzunza, a money launderer, and Jose Olivas Chaidez, a key narcotics trafficker, have been designated as Specially Designated Narcotics Traffickers (SDNTs) for materially assisting, supporting, or providing services to the Sinaloa Cartel and/or high-ranking Sinaloa Cartel members, including Joaquin “El Chapo” Guzman Loera and Ismael “El Mayo” Zambada Garcia and his top lieutenants. OFAC has also designated two Culiacan, Sinaloa-based companies, Nueva Atunera Triton, S.A. de C.V. and Operadora Eficaz Pegaso, which are owned, controlled, or directed by, or acting for or on behalf of, Juan Manuel Alvarez Inzunza. As a result of today’s action, all assets of those designated that are within U.S. jurisdiction or are in the control of U.S. persons are frozen, and U.S. persons are generally prohibited from engaging in transactions with them. Juan Manuel Alvarez Inzunza is a Mexico-based money launderer and drug trafficker who provides key money laundering services to high-ranking Sinaloa Cartel members. 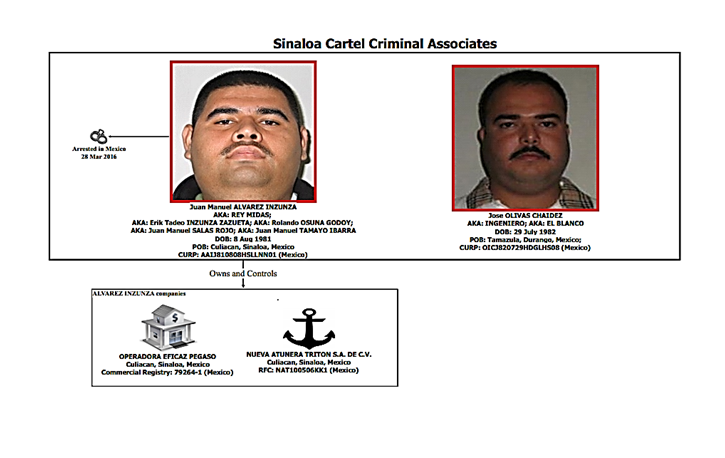 These members include senior Sinaloa Cartel lieutenants Jose Guadalupe Tapia Quintero and Alfonso Limon Sanchez, both of whom operate on behalf of Sinaloa Cartel leaders Ismael Zambada Garcia and Joaquin Guzman Loera. A Chiapas, Mexico-based Sinaloa Cartel associate, Jose Olivas Chaidez, oversees a multi-national narcotics trafficking cell that distributes bulk quantities of cocaine to Southern California. Alvarez Inzunza assisted Olivas Chaidez with transmitting million dollar quantities of drug proceeds from the U.S. to Mexico and throughout Central and South America. Alvarez Inzunza was arrested by Mexican authorities in March 2016. Today’s designation also targets two companies, Nueva Atunera Triton, S.A. de C.V., a tuna fishing company, and Operadora Eficaz Pegaso, a money services business, both of which are owned and controlled by Alvarez Inzunza. This OFAC designation was taken in coordination with U.S. Immigration and Customs Enforcement’s Homeland Security Investigations, the Drug Enforcement Administration and the government of Mexico. This designation is part of a larger effort to use financial sanctions to aggressively dismantle Mexican drug trafficking organizations. Since June 2000, more than 1,900 entities and individuals have been named pursuant to the Kingpin Act for their role in international narcotics trafficking. Penalties for violations of the Kingpin Act range from civil penalties of up to $1,414,020 million per violation to more severe criminal penalties. Criminal penalties for corporate officers may include up to 30 years in prison and fines up to $5 million. Criminal fines for corporations may reach $10 million. Other individuals could face up to 10 years in prison and fines pursuant to Title 18 of the United States Code for criminal violations of the Kingpin Act. Se ve que comen bien los compas. I bet they flip a coin aver quien va por los taquitos y refrescos. Compas, compas, no se acceleren! La Jente Linda de MICHOACAN y SINALOA Siempre han trabajado juntos, lastima que nomas para hechar DESMADRE.. Pongan se las pilas y agarren la onda, educanse y tumben al pinche gobierno ratero en ves de andar de "VALIENTES",entre ustedes mismos!! junten la lana y ayuden al PUEBLO ..cuando el pueblo te estima y no teme, siempre habra paz...que dios Los bendiga a todos en Mexico ...y ARRIBA MICHOACAN MIS PLEBES! King midas has already been arrested in mexico.. He was set free ?? I was wondering the same thing, but I reread it. And It appears US treasury is imposing sanctions on the men. They are locked up in Mex and US is now stopping their financial abilities. Maybe they can enjoy some donuts in prison and die from morbid obesity instead now. Al compa de la 1era pic en el bajo mundo del organized crime se le conoce tambien como "Fat Cuz"y el segundo en lugar de 2 Chains lo conocemos como el "2 Chins"
So....These guys have lost their jobs?Next up until that person hits the Kingpin list.Could be years and there is always another replacement.